Community table is a ministry of Ocean Park Lutheran Church and Ocean Park United Methodist Church offering a free hot meal every Monday between 11:30 am and 1 pm. People may either come to pick up take-out meals at Ocean Park Lutheran Church, or they may eat in, or have a meal delivered. Members of the community may call Ocean Park Lutheran and request to have a meal delivered at the north end of the peninsula. How many meals are served? Current numbers are around 80 meals served each Monday. What type meals are served? The menu consists of a hot dish, a salad or vegetable, fruit and a cookie. Current menus include spaghetti, chili & corn bread, hamburger goulash, tuna casserole, macaroni & cheese with ham, turkey pot pie, meat loaf, or beef chunks on rice. Where does the funding for Community Table come from? Community Table is funded totally by donations -- members of the community, church members, church groups, and fund raising events. We apply for matching funds for fund-raising events through Thrivent for Lutherans Community Services and Ocean Park United Methodist Church. What is the average cost of a meal? By careful shopping and purchasing, we keep the cost of each meal between $1.75 and $2.00. Who volunteers at Community Table? We have at present 35-40 people involved in cooking, serving, delivering and cleaning up. These volunteers work on one of eight teams which serve on a weekly basis, two from Ocean Park United Methodist, and six from Ocean Park Lutheran. Two drivers do the bulk of delivery every week. How can someone get involved in Community Table? 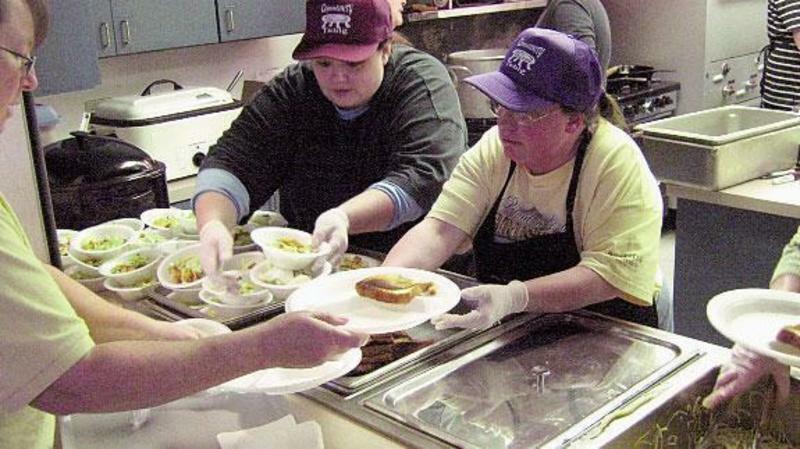 We welcome additional volunteers – delivery people, cooks, servers, clean-up people and substitutes are always needed. Please call the Ocean Park Lutheran at 360-665-6344 or Community Table coordinators Mike and Sidsel Tompkins at 360-665-2674. Thank you for supporting this community service!